I’ll be adding reviews of the tools I’m currently using or trying out here and what I think of them. 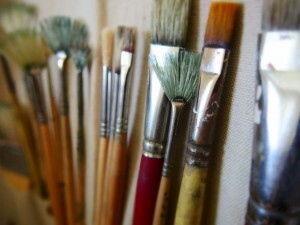 As an artist you’ll need a variety of tools…to get started out I’d recommend beginning with basic sets of pencils, paintbrushes, paints, charcoal pencils or sticks, erasers, drawing paper, canvas boards and wrapped canvases. If drawing or painting is something you’re just getting into it might take awhile to figure out which brands of tools you prefer, but usually you can get a decent set of brushes, pencils, paints, etc. on the beginner level to use until you get more advanced. In the meantime…Need Art Supplies? Below are some of the many brands I’ve used in the past and been quite satisfied with using in drawing and painting traditionally. Want to Start on Digital Art? Yes, it’s the smallest one, but I love it! Eventually I might get a larger tablet, but for now this works wonderfully! Interested in creating 3D images, characters, or animations?